Last week flew by. The weather in Tuscany has been almost tropical. Rain storms are followed by long hot days, and the grass seems to be growing faster than anyone can cut it back. Our horses out in the turnout field still have more than they can handle, and are all fat and happy looking. 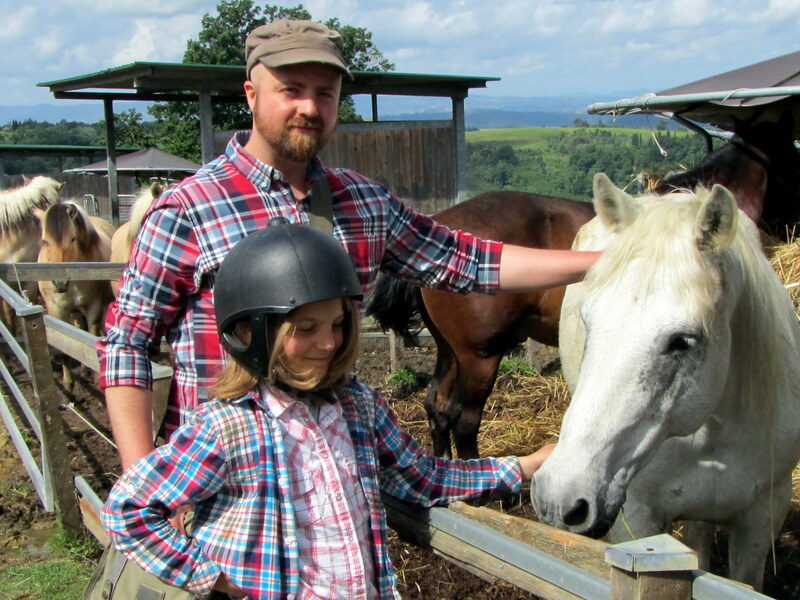 This last week we had a family from Sweden out riding with us. 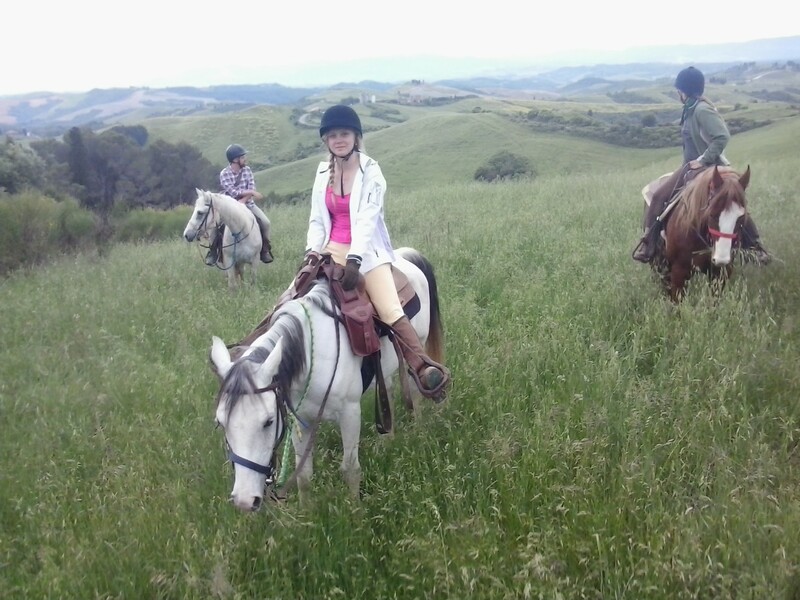 They were horse owners, and very good riders, and I had the chance to test out various horses on the trail with them during the week, including little Shakir the Arabian who became the firm favorite of Linnia, the daughter of the family. 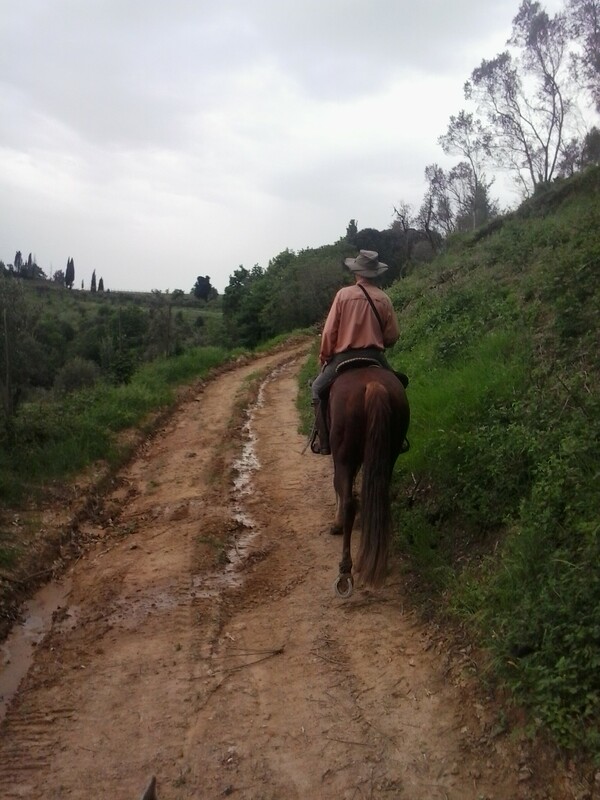 We saw a lot of wild boar one day, and enjoyed some lovely riding down in the Castelfaldfi game reserve, the newly finished Natural reserve of Cafaldo (full of lovely forest trails for the horses) and up towards Barbialla and Sughera. 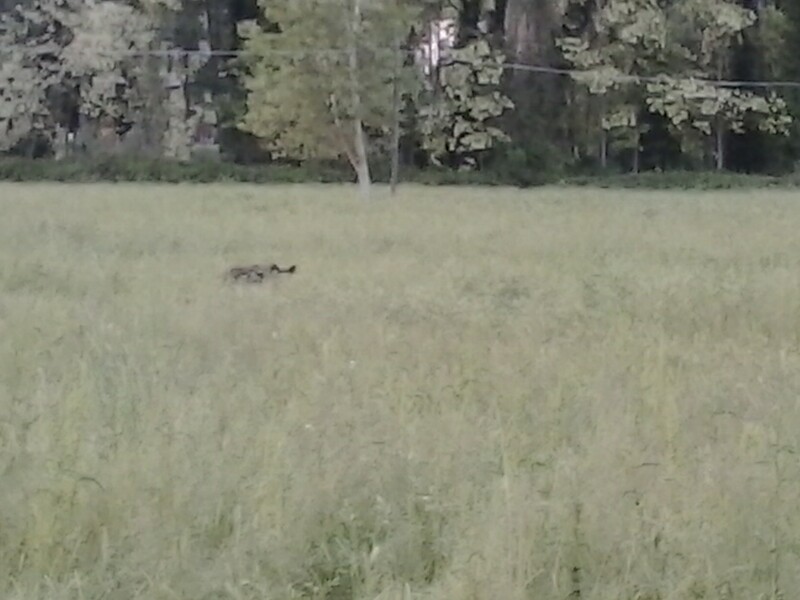 Here are some pics of the week, including one of a large wild boar hiding in the grass. The next two weeks are very busy at Castellare with Pentagosto and a public Holiday in Holland and Switzerland this week. This morning I took a Group of returning Swiss clients out, with a lovely English rider who lives in Holland. The weather early this morning looked Grim, but actually it turned out very nice, and I hope this afternoons ride will be even better since the breeze should have dried out the trails up on the communal road to Corrazano where we are heading after lunch. Above is Rikkard and Lucas with Blanco. 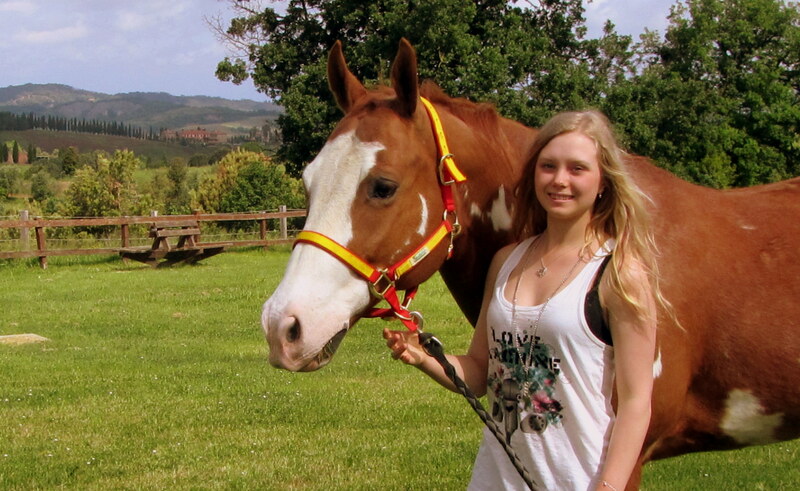 Helen with Mascherone our four year old Paint horse. They made a great team all week long. Linnia and little Shakir. 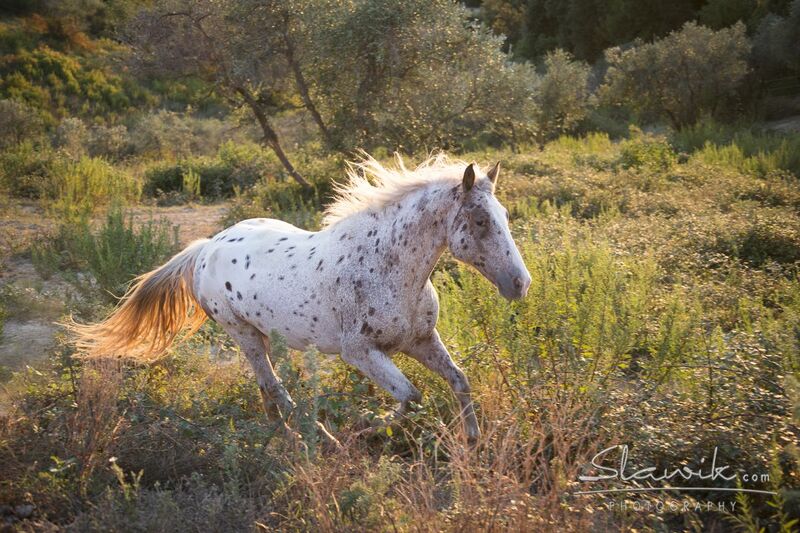 He was a star all week too, and they were a great pairing since her mother bred Arabians back in Sweden. One of our full day rides visits this historic villa in the Peccioli region, which lies under Pisan rule. 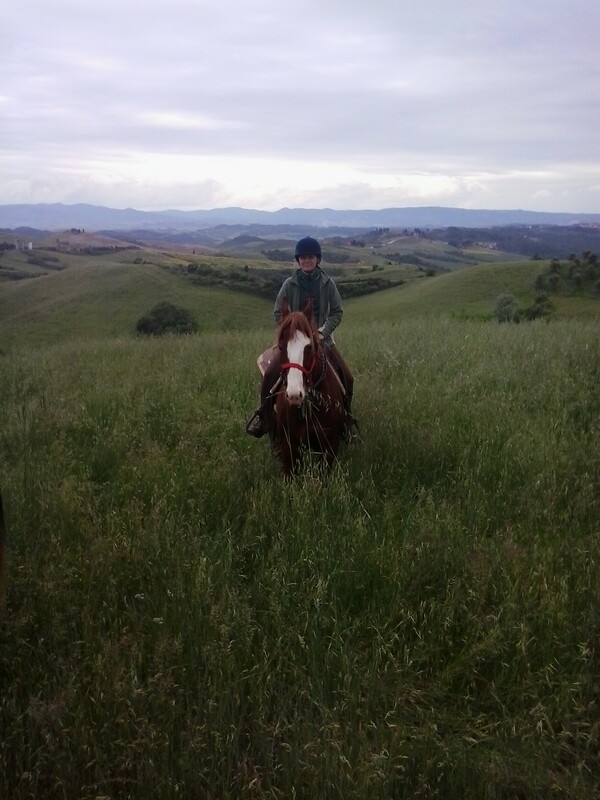 The Villa Monti is part of a large cattle farm and the owners today also have a couple of horses. This is one of my favorite sections of the rides we do. One of the clients last week asked me, “Which is your favorite ride”, my answer was that I have no favorite ride in itself. All rides have parts that are lovely,and other parts that are nice, but nothing special. Some rides have (thankfully) small sections that are not lovely at all.. bud necessary to get from A-B. It is the journey, and sometimes the destination that matters to me. In saying that. The Monti farm is one of the sections that I love. Soft and eye pleasing scenery, that feels almost like it has been frozen in time. Dirt roads wind around cattle fields and ancient stone farm houses. Wildflowers carpet the Hills, and Cyprus trees line the driveway to the villa. Riding up this imposing road, one feels much as the original owners wealthy banker buddies would have felt in the 1400’s. The soft and steady clop of the horses feet. The slightly sour smell of cattle, mixed in with that of lush spring flowers and pine. The original owner of the huge Villa Monti was a Bardi count. The Bardi’s were relatives of the Medici, and they too were one of the big names in banking during the Florentine renaissance period. The wife of Cosimo di Medici (and grandmother to Lorenzo) was a Bardi. The Villa monti sits at the heart of the farm, on a panoramic hill that looks over the countryside below it. Historians think that the famous architect Buontalenti created the villa over top of ancient ruins of another building. The villa was originally created as a hunting lodge for the rich and powerful Florentine families. One interesting tale of the villa has it that the Villa is haunted to this day with ghosts, including that of a White horse which gallops at night through the surrounding countryside, and is seen most frequently when there is snow on the ground. 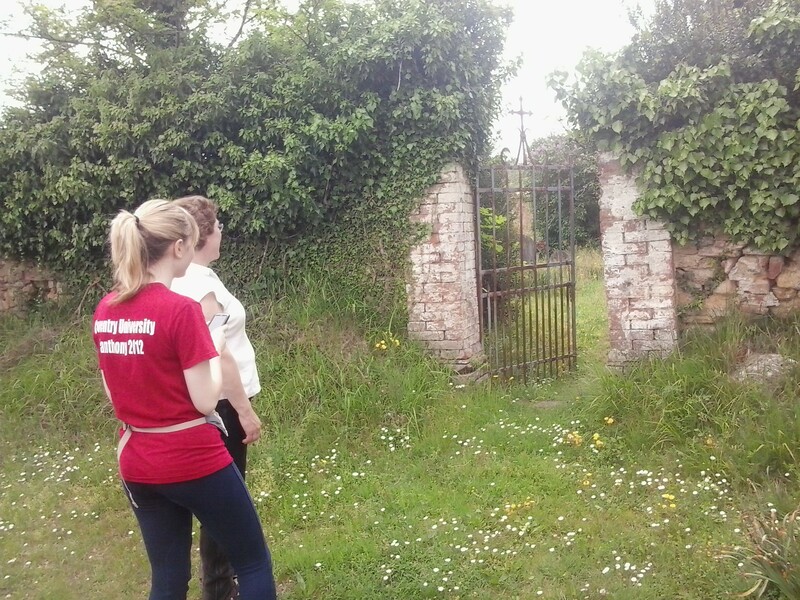 A fitting location perhaps for our horses to visit. There is so much history to these Renaissance homes. So many untold secrets lie within their walls. They were tough times for women, and many wives and lovers met their demise in awful ways, only to be quickly sent off to the family crypt under guise of a ‘sudden illness’. Villa Monti today stands quietly in the shadows of a beautiful landscape, holding these secrets tightly; making it only even more intriguing to visit. Last week we had a busy few days trying to cheat the weather, and manage to squeeze all full days of riding in before Thursdays predicted rain storms. We did it too, and managed to ride to San Vivaldo Monastery, Cedri, and the historic farm of Barbialla before the rain hit. Below is the picture of the Barbialla cemetary, a sad but very interesting spot hidden in the quiet Hills between Corazzano and Sughera. 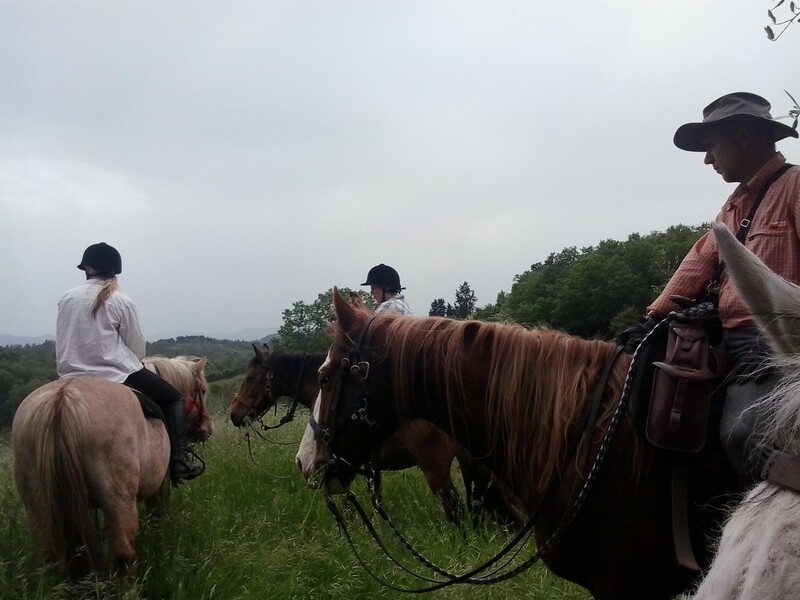 The British clients we had last week, were fine taking a half day in the rain on Thursday morning – and though the ground was sodden, the weather cleared up as we rode. We stopped off at the artists Riccardo Neggi’s house, and enjoyed a couple of nice canters afterwards on the road home. One of which was so bouncy on the little Arab, that I lost my car Keys and had to drive back afterward in the work car to find them. Lucky for me one of the riders spotted them enroute, thus I managed to avoid a long walk back down the muddy trails in search of the elusive item. We had Paulo Arrantes here this week for a few days. He is our Brazillian agent, and also is a guide for two trails in his homeland. He was a really nice, easy going guy – and a good rider, so well suited to his four year old Paint horse Mascherone pictured below with him. On Friday (the clients day off) I dropped them up at the station to train into Florence for a day of culture and shopping, and I furiously tried to get everything ready for my 6pm flight to London. I managed to get to the UK without too many hitches, and trained out to a friends house for the night. On Saturday we bused down to Bristol to meet other friends, and headed to the Badminton Horse Trials; where I helped out on the In the Saddle stand over both Saturday afternoon and Sunday. I managed to sneak out over lunch to watch some of the cross country, and met up with loads of clients, friends and possible new clients at the stand. It was a great event, and if you are considering attending in the future, I whole-heartedly reccommend it. Well organized, great shopping, food options, and even live music in the evenings.